I visited my friends in San Francisco, Los Angeles and Vancouver, Canada, and I tried to immerse them in Korean food by letting them taste several dishes: samgyupsal, tteokbokki, japchae and bulgogi. 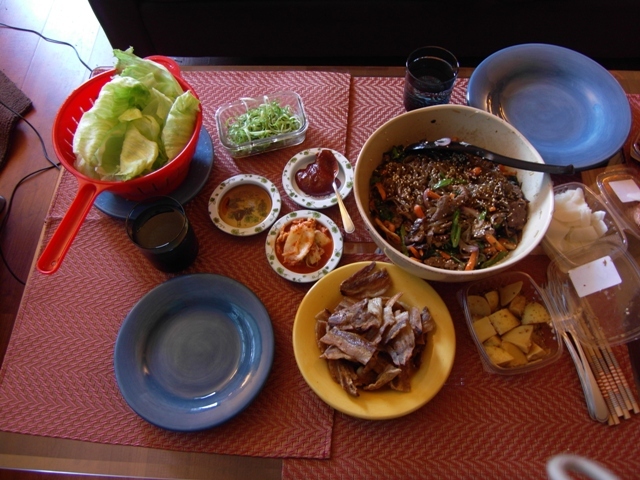 Dinner in Vancouver: I prepared samgyupsal and tteokbokki for friends and we bought several Korean side dishes and they loved it. Finding ingredients for the two dishes in Vancouver was quite easy. Vancouver is a multi-cultural city and there are several Asian supermarkets and Korean grocery stores where you can find items. We made a quick trip to a Korean supermarket in downtown Vancouver and picked the ingredients. The food turned out all right. This was the first time that my friend and her husband tasted samgyupsal and japchae and they both loved it. The feeling was so nice when I saw the two of them eating what I had prepared. Hoping that when I come back to Vancouver, I can cook more Korean dishes for them.